As an investor, it's difficult to understand what's happening in the markets, and how and why this effects your money and investments. Clearly 2018 did not follow suit with the previous 9 years of overall positive stock market returns and we'd like to give you a quick summary of how things played out. Keep in mind this is normal and investing takes time, there will always be bumps in the road and down years are to be expected. 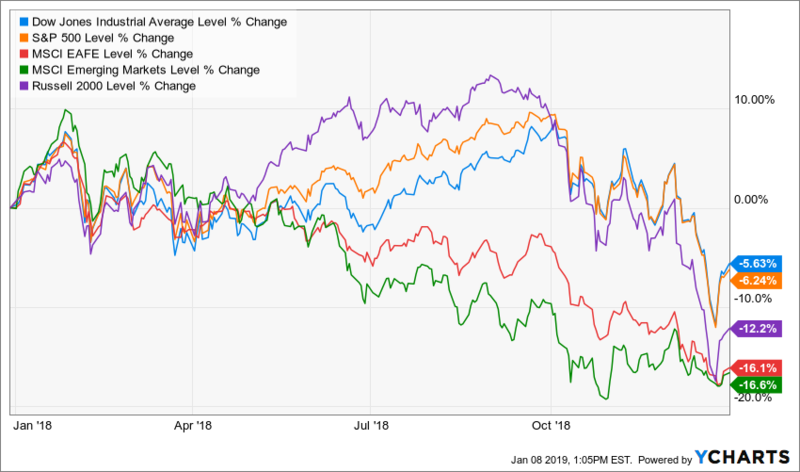 To summarize, the S&P 500 (500 largest companies in the US) was down for the year -6.24%, the Dow Jones Industrial Average -5.63%, MSCI EAFE (developed international stocks) -16.1%, Emerging Markets (think China, India, Russia, Brazil) -16.6%, and Russell 2000 (small company index) -12.2%. 2018 was extremely volatile, with both the S&P 500 and Dow hitting their record highs in September and October respectfully, only to see the worst December since 1931 in both major indices. The chart below shows January 1st - December 31st from last year of each of the indexes referenced. Why did we see these market declines? -Keep a long term focus, investing takes time and discipline. -Do a check-up on your overall asset allocation (blend of various stocks and stock funds, bond, cash, etc). We do our best to be sure every client is invested exactly how they should be and are happy to review your 401k or outside accounts. -We're not concerned over a down quarter or down year, but if you are - call or email us. Our responsibility is to be sure you're making the right choices, and we're here to answer any questions you have or meet to have a discussion.